It’s the time of year where each morning feels like a gift: the sun shines through leaves beginning to turn, the air is cool and crisp, and sweaters are welcomed once again like old friends. Hot air balloons fill the early evening skies and the streets of downtown are filled with folks so happy to be here. Rivertown Inn has so much to share with you this season: the exquisitely appointed Arthur Conan Doyle Grand Suite is our new room, and it’s fast becoming a guest favorite. A Strengths-based marriage retreat in November, a holiday open house in December, and of course our First Friday Dinners, which are gaining rave reviews. As always, we’re so grateful to you, our newsletter subscribers. As a special thanks we are providing tickets to the Historic House Tour to guests staying the weekend of the event, see details below. Thank you so much for following the Rivertown Inn. Our fall classes are filling up; call today to reserve your space. All classes feature hands-on instruction, plentiful food and wine samplings and take home recipes. All dietary restrictions are welcome with advanced notice. Class size is limited to 6 participants. Call (651) 430-2955 today to reserve your space. $75 per person plus tax. Advanced reservation required. For more information, and to see all of our classes for 2018, please visit our Cooking Classes page HERE. Create a 4-course meal using foods from the autumn harvest. Learn the basics for making mouth-watering soups and stews to nourish you through the winter. We’ll also be making two types of bread for sopping up the soup in the bottom of the bowl! On the menu: Butternut Squash Bisque, Chicken Noodle with Homemade Noodles, a hearty stew, and homemade Focaccia and French Bread Rolls. Learn how to make show-stopping Spanish tapas for easy holiday entertaining. Join us every first Friday of the month for a culinary tour of the world! Dinners begin at 6:30pm; $75 plus tax & gratuity. Enjoy a four course meal prepared by Chef Maggie along with wine (or non-alcoholic pairings, if requested). You don’t need to be a guest of the Inn to attend. Join us for a night out in historic Stillwater in our beautiful dining room or patio, weather permitting. Photos from the archives of Greater Stillwater Chamber of Commerce, ArtReach St. Croix, Take Me To The River, Rivertown Fall Art Festival. TAKE ME TO THE RIVER – Every weekend this September, ArtReach St. Croix presents Take Me to the River: art fairs, music festivals, open artists studios, gallery exhibitions and more. The natural beauty of the St. Croix River has attracted artists and outdoor enthusiasts for generations and creates a breathtaking backdrop for this growing number of fall art events. Any weekend in this month you will find an offering of the arts along our beautiful river. More information HERE. 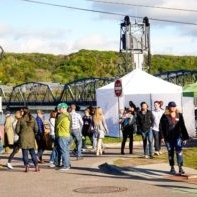 RIVERTOWN FALL ART FESTIVAL, October 6th & 7th – Stillwater’s juried and ever-growing outdoor art festival will feature a vast array of original work from Midwest artists, live music, and wonderful selection of food and drink vendors. 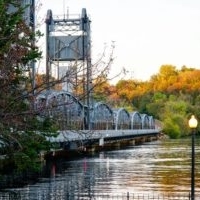 Located in Lowell Park on the banks of St. Croix River, just down a short walk from the Rivertown Inn, this art festival is not to be missed. More information HERE. NOOKS & CRANNIES TOUR, Saturday, October 6th, 10am - 3pm – Explore the areas of the Historic Courthouse that are typically closed off to the public, including the basement, dome, sheriff's residence and step inside the 1870's jail that housed women and juveniles. Enjoy refreshments and local treats, historical displays, the courthouse video, vintage photos and more in the historic courtroom. The history exhibits and 1900's County Jail will be open for viewing at your own pace. Small group tours conducted approximately every 20 minutes starting at 10am - 3pm. $10 suggested donation for adults. More information HERE. STRENGTHSFINDER MARRIAGE RETREAT, November 2nd, 3rd & 4th – Spend a weekend that will shift your perspective. Not intended as therapy, it’s about moving forward with a unique appreciation for the best of each other. No dirty laundry aired to the people at the table: you’ll listen, you’ll learn, then you’ll go off on your own to personally consider what this means for the two of you. Based on the science and wisdom of the Gallup StrengthFinder assessment, it’s a game changer. See below, or text-call 651.308.8745 for more information. It’s the best investment you can make in your relationship. More information below. The Historic House Tour is happening October 7th, and if you’re a guest of the Inn on Friday, October 6th or Saturday, October 7th, we’ll cover the price of your ticket(s). A $25 value per person (maximum $50 per reservation) this is a rare opportunity to see some of Stillwater’s finest homes. This is a great opportunity for registered guests to enjoy all that Stillwater has to offer during this beautiful time of year. More information about the Stillwater Historic Homes Tour can be found HERE.